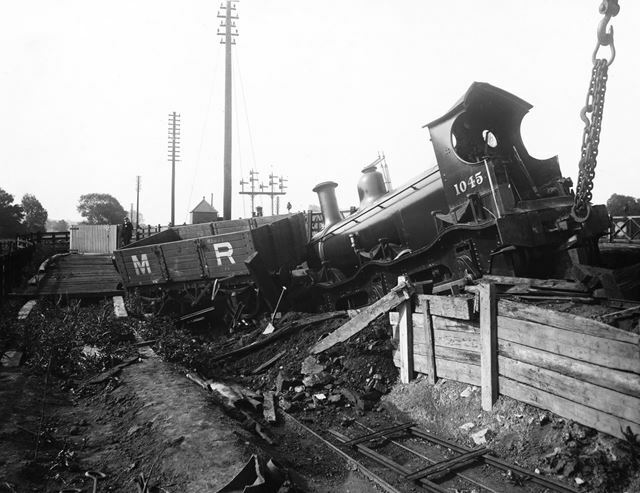 The aftermath of a derailment on the north side of Breadsall Crossing on the main Midland Railway route linking Derby with Sheffield. The photographer is looking south and the level crossing can be picked out in the background. 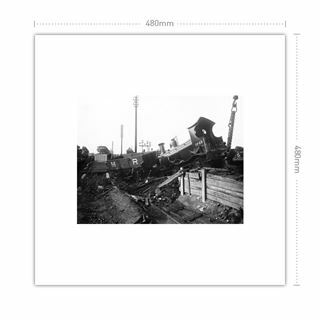 MR Kirtley double-framed 0-6-0 goods locomotive No 1045 appears to have failed to stop when on the No 2 Up (southbound) Goods Line, demolished the bufferstops at the end of the 'neck' protecting access to the main running lines, and ended up at an angle in a lineside drain. The chains attached to the dragbox of the engine indicate the presence of a crane which is about to attempt to pull the loco back onto the rails and this and the rest of the breakdown train can be seen in image DCCS001307. Breadsall Crossing took Ford Lane across the railway between Allestree and Little Eaton and eventually there were four tracks across the road at this point controlled by a signal box with a 28-lever frame on the south side of the level crossing. Construction of the dual carriageway Abbey Hill section of the A38 trunk road involved building a new bridge over the railway which in turn allowed Ford Lane to be diverted and the level crossing to be abolished in 1969. No 1045 was one of a large number of goods engines of this type constructed for and by the MR between 1850 and 1874. A product of the Glasgow firm of Dübs & Co in 1873, it managed to survive this particular undignified escapade, not being withdrawn from service until 1933, by which time it had become London Midland & Scottish Railway (LMS) No 2847. 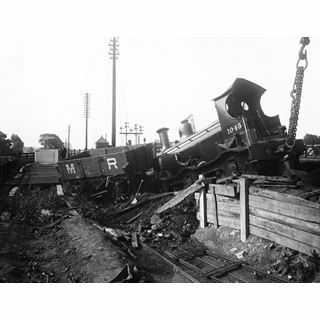 Picture the Past website contributor Dave Harris has kindly provided further details of this accident: A report in the Derby Daily Telegraph, dated 30 June 1903 reads as follows (some exaggeration may be detected): 'RAILWAY ACCIDENT AT LITTLE EATON. ENGINE FALLS OVER AN EMBANKMENT. A FIREMAN BADLY SCALDED. In the small hours of this (Tuesday) morning a somewhat serious accident occurred to a goods train at Little Eaton, the fireman being also very badly scalded, and being now an inmate of the Derbyshire Royal Infirmary. It appears that a Midland goods train from Manchester to Derby had passed through Duffield station, and on arrival at the junction backed onto the Little Eaton branch for the weighing of some of the wagons and other purposes. Whilst standing on the branch the driver mistook a signal to proceed which was really intended for the driver of another goods train coming in the opposite direction. The effect would have been that the two trains would have come into collision, and in order to avert a more serious disaster the train was run into a siding. The driver (Cockram) and the fireman (Hannah) did not know they were on the siding, and after going a short distance the engine ran into the 'dead end'. Fortunately, they were only proceeding slowly, but notwithstanding this the engine banged into the stationary buffers with such force that the latter were knocked clean out of the ground and the engine was knocked off the line. It ploughed its way through the ground on to the edge of the siding, and then fell over. The tender and three wagons were also dragged with it. The engine rolled over and it is believed that both the driver and fireman jumped off. The former sustained no injuries eccept a good shaking, but the fireman was very badly scalded by the steam escaping from the boiler. The fireman managed to get to the signal box and inform the signalman, who had heard nothing of the accident. The latter at once communicated with the authorities at Derby Station. It was found that the fireman's injuries were of such a serious nature that he was put into the next passing train and conveyed to the Derby Infirmary. There he was attended by Dr Hope, the house surgeon, and it was ascertained that he was seriously scalded all over the body, and his condition was critical. His name is Arthur Hannah, aged 31, and he resides at 44, Becher-street, Derby. 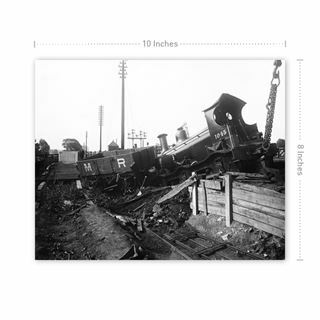 A considerable portion of the line was wrecked, and the breakdown gang, which was immediately despatched to the scene of the accident, was engaged for some hours clearing away the wreckage. The guard was not injured at all. 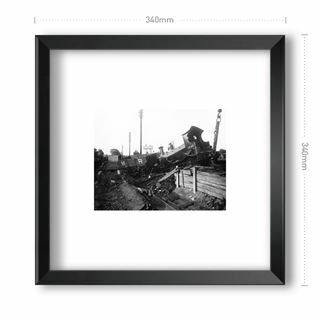 The exact time at which the accident occurred was one o'clock, and the place was about a mile from the Peckwash Siding, where some two years ago an engine went down an embankment under somewhat similar circumstances, the accident unfortunately being attended by loss of life. Upon enquiry at the Infirmary this afternoon, it was ascertained that the condition of Hannah was as favourable as could be expected under the circumstances.' Information contained in the Midland Railway's Locomotive Salary Book No 2 reveals that Arthur Hannah was born on 25 April 1872 and was first employed by the MR in 1892 as an engine cleaner, becoming a passed fireman three years later and a fireman proper in 1899. Amongst something of a catalogue of injuries, including ankle and back sprains (1896), a bruised hand and cut head (1900) and his left eye burnt by a spark (1903), it also confirms that on 30 June 1903 'Upper part of body scalded. The driver ran the engine into a stop-block and the engine then fell down the embankment. Owing to the gauge glass breaking, Hannah was severely scalded before he could extricate himself.' While Hannah survived his injuries, on 29 December the same year it was recorded that 'it is not likely Hannah will be suitable ... to take up his duties on the footplate again' and it was nearly a year before he resumed duty, a job having been found for him by the Company as a Platform Pilotman's Assistant. Subsequently he must have left the railway as the 1911 National Census indicates he had become a fishmonger.